As summer starts drawing to a close and more difficult weather begins to set in, it is a good time to consider how to mitigate the impacts of weather on our military operations. Weather can have a devastating impact on military operations – whether from rain, sleet, snow, fog, and even sand storms and dust suspended in the atmosphere. 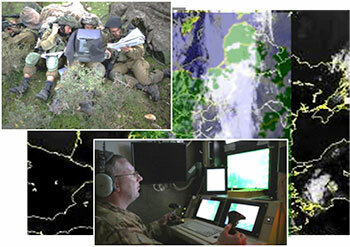 As our military becomes ever more reliant on C4I, communication links play an ever more important role in military operations. Winter is coming, so when it comes to satellite communications, it is an especially good time to get Mother Nature on our side by firmly incorporating virtually-weatherproof X-band SATCOM into the DoD’s C4I arsenal. SATCOM transmissions that operate at higher frequencies have to be adapted to poor weather conditions. SATCOM transmissions that operate at higher frequencies (like Ku, Ka) have to be adapted to poor weather conditions. This is done by either 1) consuming more and more bandwidth and cost (using costly “spread spectrum” technologies), or by 2) utilizing Adaptive Coding and Modulation (ACM) technologies, which fixes the bandwidth problem but slows down transmission speeds in poor weather. When it comes to bad weather, we don’t want to divert money from boots and bullets towards more bandwidth, or have to tolerate slow performance. Fortunately, we don’t have to with X-band. Situated in the 7.25-8.4 GHz frequency range, it is virtually weatherproof and particularly excels when using small, portable antennas that define today’s highly-mobile, precision military operations. We have many customers operating airborne and manpack antennas as low as 18” and smaller. X-band is so good, it is the weatherproof frequency band found on virtually all military satellite communications (MILSATCOM) constellations around the world. As summer draws to a close, weatherproof our SATCOM to ensure the highest throughput and highest quality link – as a top priority, so that our forces can successfully operate 24/7/365 in the world’s harshest operating environments. It is always a good time to get Mother Nature on our side, and this is done in part, by firmly incorporating X-band SATCOM into the DoD’s C4I arsenal.